TUSCALOOSA, Ala. — Tua Tagovailoa has gone viral again. It has been 10 months since he won a national championship with a walk-off touchdown pass, and many touchdowns later he sits in the Alabama football facility wearing a school beanie and headphones. His diamond earrings glimmer under the office lighting. 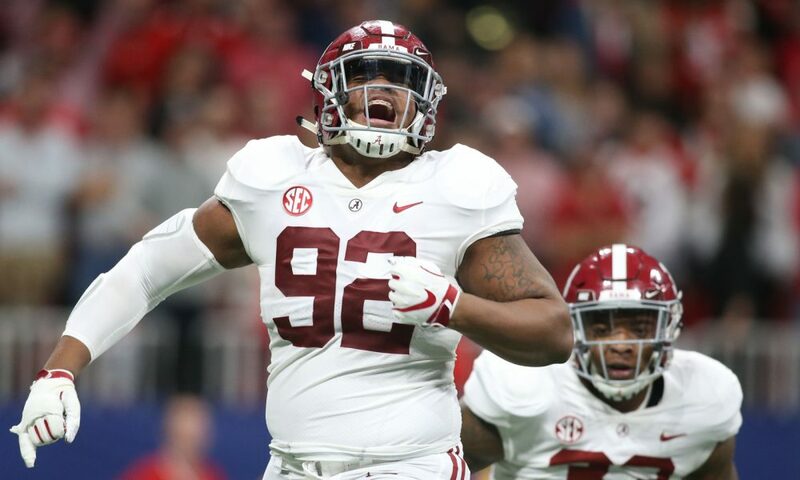 The news is unexpected and delivered by teammate Quinnen Williams. Williams, perhaps the nation's most disruptive defensive player, hands his phone to Tagovailoa, perhaps the nation's most productive offensive player. Together they watch the grainy footage of Tagovailoa taking snaps in the pouring rain by himself—video taken from an apartment or construction site that overlooks the team's practice facility. "Oh, that's not good," Tagovailoa mutters with a smile. As insignificant as these eight seconds of footage seem, they are dissected around town and discussed on local radio stations all afternoon. With Tagovailoa suffering from a right knee injury, this limited footage provides hope for those who saw him knocked out of the team's game against Mississippi State only days earlier. "Tua can't even go to Walmart by himself," Williams says of the team's star quarterback, exaggerating only slightly. All this attention has come despite Tagovailoa's best efforts to keep the spotlight away, something he has tried to do since he traveled more than 4,000 miles from his hometown of Ewa Beach, Hawaii, to Tuscaloosa. Since then, solely with his spectacular play, he has done something no player has under Nick Saban: He's taken some of the spotlight from perhaps the most accomplished head coach the sport has ever seen. In less than two full seasons, Tagovailoa has won a national championship in heroic fashion and put together one of the greatest offensive campaigns in college football history. Soon, he could win the Heisman Trophy and a wealth of other individual awards. Despite hype that has at times felt unrealistic, Tagovailoa has somehow surpassed even the wildest expectations. The attention is no longer confined to the sport or state he plays in; these days, even Drake is popping up in his direct messages. So are current and former NFL quarterbacks who can't help but celebrate this rare talent and his remarkable season. Tagovailoa did not ask for any of this. In fact, with a few exceptions, he would rather continue to live out of sight. But with each touchdown and perfectly placed deep ball, that's becoming harder and harder to do. "He's a GOAT," Williams adds as he pockets his cellphone and tacks on one last compliment to make his quarterback squirm. "He's going to win the Heisman twice." Between classes, Tagovailoa can sometimes be found in the passenger seat of a golf cart, going from one part of the campus to the other. With his tight class schedule, there isn't time to stop for the influx of photograph and autograph requests—something that follows him just about every step he takes outside the football facility. So, oftentimes, in the interest of not being late, he hitches a ride. At restaurants, Tagovailoa can no longer simply go out with his friends and have a normal evening. Waiters and waitresses can't help but say hello. Neither can people at the nearby tables. Even store managers have to make an appearance every now and then. "The lifestyle has just become different," Tagovailoa says. "Things just aren't the same." Away from football, Tagovailoa keeps to himself, spending time with his family, who live a little more than an hour away. Rather than go out, he'll often stay in and play guitar, ukulele or piano. Like millions of college students, Tagovailoa has become obsessed with Fortnite. Even in the virtual world, he lives a normal life, using the basic character. But not because he doesn't want anyone to know he's playing; he just wants you to think he's never played before. "I'm just a noob," he says. "Or at least I'll pretend to be." The place Tagovailoa finds the most comfort, however, is the place where he always felt the most natural. While great players have often come undone in the biggest, most unsettling moments, he welcomes them. "Playing in the national championship in front of so many people, it's not as nerve-wracking for me as people might think," Tagovailoa says. "Playing at LSU with that many people in such a hostile environment, it's really exciting. It doesn't get me nervous to go into the game and play because it's something that I'm kind of comfortable doing. We're just going out there to play football." This isn't something Tagovailoa discovered when he arrived at Alabama. For him, this confidence can be traced to his home state, where he grew up idolizing fellow Hawaiian quarterback Marcus Mariota. By age 10, Tagovailoa was already throwing with high school quarterbacks around the state. "No fear at all, just like he's playing right now," says Vince Passas, Tagovailoa's quarterback coach at Saint Louis High School. Passas has coached in Hawaii for more than 40 years, having also worked extensively with Mariota. He's asked: What if Mariota and Tagovailoa had played for him at the same time? "I would hate to have made that decision," he said. "But Tua's probably the most accurate-throwing quarterback I have ever seen. He's got this knack. The way he spins it. ... His accuracy. The confidence." Heading into Saturday's SEC Championship Game against Georgia, Tagovailoa has accounted for 41 touchdowns (36 passing and five rushing) and thrown only two interceptions. He has accomplished this despite attempting only three fourth-quarter throws—a product of the blowouts he's orchestrated. Tagovailoa won't take credit for any of this. He will tell you Alabama's 12-0 record is because of the talents of his incredible corps of wideouts: Jerry Jeudy, Devonta Smith, Henry Ruggs III and Jaylen Waddle. He will tell you he's been successful because he has the best tight end, running backs and offensive line in the country. And he's sincere. "They really do make me good," he pleads. He isn't wrong. It is a luxury to be surrounded by some of the nation's most gifted athletes, but Tagovailoa has also done his part. His passer rating of 212.51 is on pace to shatter former Oklahoma quarterback Baker Mayfield's record of 198.92 that he set last season. "It's crazy because you don't ever really notice that you're witnessing greatness," Alabama running back Josh Jacobs says. "The plays he makes are so difficult, but he makes them look so effortless." His accuracy, a 70.3 completion percentage, and feathery touch on the ball are uncanny. As is his ability to generate long completions. Tagovailoa has connected on 12 passes of 50 yards or more and four of 70 yards or more, both of which are tied for first in the nation. He does this despite not being the classic NFL prototype. In fact, before the duo committed to Alabama together and became one of the nation's most lethal offensive combos, Jeudy had questions about this mysterious 6'1" lefty quarterback from Hawaii, based on what he saw through highlights. Then they were paired at a recruiting camp, and everything changed. "When I saw him throw the ball in person, I knew I was going to Alabama," Jeudy says. "He puts the ball in places only we can make plays." The line of cars that stretches up the hill on Warrior Parkway is at least 40 vehicles deep, filled with Alabamians anxious to pay $5 to park at Thompson High School's new 5,300-seat football stadium. While Tua has done his part to capture Saturdays, Taulia, Tua's younger brother, owns Friday nights. In a game that generates interest across the state, Taulia leads Thompson to a thrilling 21-20 win over Vestavia Hills. Taulia, a senior, has verbally committed to play next fall at Alabama—a decision that has Crimson Tide fans eager to see whether Tua's younger brother is as good or better than he is. "This is kind of forcing me to be good," Taulia said in the spring. "I have to now. It's pretty much mandatory. To me, it wouldn't make sense for Tua to be really good and his brother to be so-so. I tell myself I have to work hard because I have to be good." Like Tua's, Taulia's life changed rapidly after his brother's heroics in the national championship game. The spotlight shone brighter on him as well. And when he verbally committed to play with his brother, his celebrity status grew. In 2017, the Tagovailoas relocated from Oahu, Hawaii, to Alabaster, Alabama—a short drive from Tuscaloosa—so they could watch their sons play college football. "It's all built around the family," Ron Lee, Tua's offensive coordinator at Saint Louis High School, says. "That's a lot to do with their Polynesian, Samoan culture. They sacrifice so much for their children. To relocate your family like that is quite a sacrifice." Months later, Galu (pronounced Na-loo) Tagovailo watched his elder son end the college football season in the most thrilling way imaginable: a winning 41-yard touchdown pass in overtime against Georgia in the national championship game. Galu and his wife, Diane, have had to drastically alter their lives because of his performance. Like Tua, they no longer go out to eat. When they need groceries, they will often shop around midnight simply because they are less likely to be noticed. Galu and Diane have spent the past few months bouncing back and forth between Alabaster and Tuscaloosa to watch their sons play. As Tua has continued his Saturday dominance, Taulia has done his best to keep up with his brother. Last Friday, the day before Alabama’s 52-21 victory over Auburn in the Iron Bowl, Taulia led an 85-yard drive in the final moments of the 7A high school semifinals against perennial state power Hoover High School to give Thompson a 31-28 victory. It is hours before Alabama and Missouri will play in Bryant-Denny Stadium in mid-October, and floral leis are everywhere. A few hundred yards from the stadium at Gallettes, a campus bar, crimson stickers with Tagovailoa's No. 13 etched in white over a golden pineapple are handed out. That buzz from the tailgate carries over to the introductions. The 101,821 fans unleash a roar that seems to shake the stadium the moment Tagovailoa is announced. Later in the game, when Tagovailoa enters Alabama's injury tent after tweaking his knee following an awkward slide, those same fans grow deathly quiet and gaze at the covered contraption on the sideline. When he emerges and grabs his helmet, a noticeable hum returns. The culture at Alabama has long been coach-centric, with Wallace Wade, Bear Bryant, Gene Stallings and now Saban the stars of the show. But with Tua, the program's identity has changed. For years, Saban's bullish, defense-first approach has carried Alabama. While this emphasis remains, the Tide's offense has become much more explosive, largely because of Tagovailoa. Having already thrown for more touchdowns than any Alabama quarterback in a single season, Tagovailoa is 298 yards shy of Blake Sims' all-time school mark with 3,189. With at least two games to play, Tagovailoa, if healthy, will easily set the record. Since Saban arrived in 2007, two running backs, Mark Ingram and Derrick Henry, have won Heismans. Eighty players have been drafted. But during that time, one thing has always been missing: a Heisman-worthy quarterback. "With Tua, it's like Thanos finding the last infinity stone," says Cecil Hurt of the Tuscaloosa News, who has covered Alabama football since 1982, referring to Saban finally discovering his once-in-a-lifetime quarterback. For a few minutes, Tagovailoa is silent. He leans back in his chair and begins to read a handwritten letter that was just given to him. It's from a 10-year-old Alabama fan named Sidd Hobbs, who was recently diagnosed with a reoccurrence of cancer. A few weeks ago, Tagovailoa and Hobbs Facetimed. As they finished, Tagovailoa asked if they could pray. Sid has sent #SIDSTRONG wristbands for Tagovailoa to hand out to his teammates. They are scattered across the desk along with the note that Tagovailoa reads to himself. Amid the madness and hysteria that infiltrate his everyday life, these are the moments that remind him of his platform and purpose. "I get more nervous talking to people and uplifting people than I do playing in a big football game," Tagovailoa says. "But I love having the opportunity to have an impact on somebody's life. As a person who kind of holds his faith kind of dearly to his heart, I definitely think that's a big purpose for me." In time, there will be more moments. More opportunities for Tagovailoa to use his platform for good—something he is anxious to do. More touchdowns and accolades and maybe even another national championship or two at Alabama, with Saturday's SEC Championship Game at Mercedes-Benz Stadium in Atlanta the next step on that journey. With that will come more attention, and the legend that has been building these past 10-plus months in Alabama will only continue to grow. He will be studied and scrutinized no matter where he goes: from the brightest football stages to empty, rain-soaked practice fields. Many will watch, hoping to capture another glimpse of the best Crimson Tide quarterback they are likely to see in their lifetimes and eager to bear witness to what he might do next. And while the magnitude of expectations that grand could overwhelm, it is reasonable to assume his best is yet to come.